The dates are set for EcoForum 2020. Mark it in your diaries! seen? Let’s get there together! 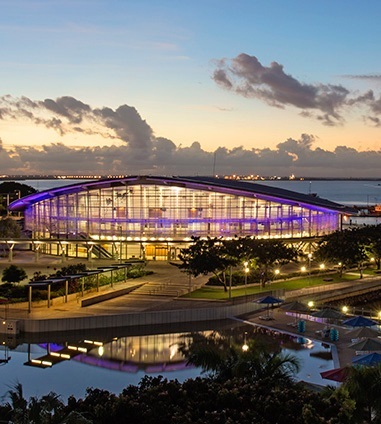 Set within the lush tropical setting of the Darwin Waterfront Precinct, the Darwin Convention Centre is a stunning destination for local, national and international delegates to experience your convention or event. Since opening in 2008, the Darwin Convention Centre has established a reputation as a modern, multi award winning Centre that consistently delivers outstanding customised event experiences, first class food and excellent personalised customer service. With a range of multi-purpose and adaptable event spaces, the Centre is large enough to cater for conventions of 1,200 delegates, yet small enough to offer bespoke and unique event experiences. Regardless of size, the dedicated and experienced team of professionals at the Darwin Convention Centre will ensure your event is a special and memorable occasion for event attendees. If you think you have what it takes to be a part of the Program Organising Commitee, please send your expressions of interest to Shardai before 30th April 2019.